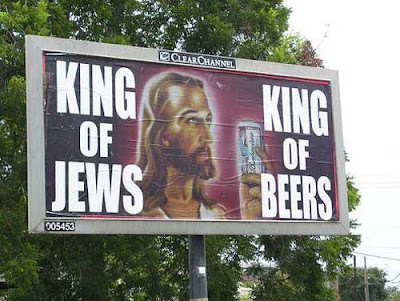 "Someone covered up a billboard on La Branch at Winbern with a poster featuring a picture of Jesus Christ holding a Budweiser can. The company that leases the billboard believes vandals made the poster at home and then pasted it on top of the ad that's supposed to be there." stop your bitching, god has a sense of humor if you didn't know. Why don't you go drink the kool-aid and follow some people off a cliff. I happen to like the ad myself. religious freaks will always be offended buy anything that's not praising a god. I happen to be more offended but crosses in my neighborhood and the word Jesus plastered everywhere. But i don't judge others on that believe. I judge others that go out of there way to tell others there wrong with them and how there going to hell and going to pay for there sins. Even though this is all noting more then what some people believe. its all irrelevant and nobody truly knows what happens to when you die. But we will all find out someday. So until that time its ok to have a sent of humor and have some fun during your life.